It is now official (well sort of official) the people of Mexico voted for president on July 1st, and after a week of recounts, claims of voter fraud, vote-buying, and ballet-box stuffing … the only certainty in this ballot is that the people of Mexico lost again. Welcome back to the PRI Party after a 12-year absence. The PRI ruled Mexico from the 1929-2000 through a combination of voter fraud, corruption, and the patronage of the national unions that were tied to and subservient to the Party. The PRI candidate, Enrique Pena Nieto, will (probably) be President for the next 6 years. 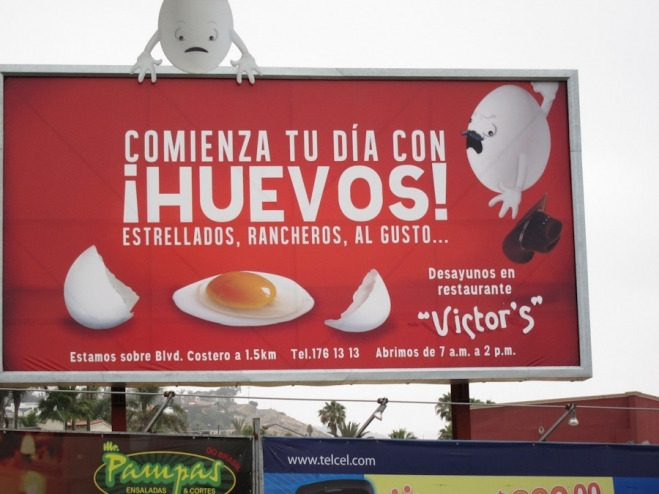 In tribute to the return to power by the PRI, here is an announcement for the return of one of Ensenada’s favorite breakfast restaurants – Victor’s Café – which also was absent for approximately these same last 12 years, and has also suddenly reappeared. Victor’s Café’s and their fresh-squeezed orange juice with fresh eggs were likely missed more than the PRI. Seagate’s factory, fishing and farming operations are in Mexico. Therefore, the Mexican elections are a part of Seagate’s World. The president-elect at the moment is Enrique Pena Nieto of the PRI. He is perhaps best known as the husband of Mexican soap opera star Angelica Rivera. Otherwise he is just another politico who worked his way to the top of his party. In Mexico, there are no primaries. The party bosses choose their candidates to run for office. There are allegations that Enrique’s party, the PRI, was giving out bags of groceries and prepaid 500-peso($37.50 U.S.) gift cards to buy votes throughout the country. This vote-buying made the news after the recipients discovered that the prepaid cards really only had 100 pesos credited($7.50 U.S.). Also helping his campaign was the almost limitless supply of free air-time by Televisa, the major t.v. network in Mexico. Pena Nieto ran on the platform of change for Mexico, which is almost an oxymoron since this party ruled Mexico under the banner of corruption for 71 years. Under the PRI, each President chose his successor. Hopefully Mexico won’t change back to their model of 71 years of autocratic corrupt rule. However the introduction of their electoral gift cards might give one cause for concern. Coming in a distant second place was Andres Manuel Lopez Obrador the candidate of the PRD (Party of the Democratic Revolution) the major leftist political party in Mexico. Lopez Obrador had also run for President in 2006 and was defeated by the outgoing current President Felipe Calderon amid claims of election fraud. Lopez Obrador is best known for erecting a tent city in the heart of Mexico City in 2006 in protest of his defeat. The tents lasted for almost 9 months, tying up traffic and commerce until he and his followers were physically kicked out of town. So far no tents have been erected by Lopez Obrador’s followers. However there was a run on tent inventory at the Mexico City Walmarts last week. Finally running a distant 3rd place was Josefina Vazquez Mota of the PAN (National Action Party), the first woman candidate for President in Mexico from a major party. Probably the best of the three candidates. Unfortunately she is from the party that has held the presidency during the last 12 years, which has been blamed for the poor economy and the continuing drug violence that has cost approximately 60,000 lives since 2006. Josefina really had no chance, victim of a voter mentality that said “throw the bums out”. The final decision on the of validity of this election may be more dependent upon the number of prepaid gift cards showing up at Mexico’s grocery stores rather than the vote count. Worst-case scenario, perhaps wife Angelica gets to co-star as her soap opera moves to Los Pinos (Mexico’s White House). Do you wonder why almost 1 out of 5 Mexicans has escaped that country and lives, most illegally, in the U.S.
You made it to the end of a blog entry on Mexican politics … congratulations. 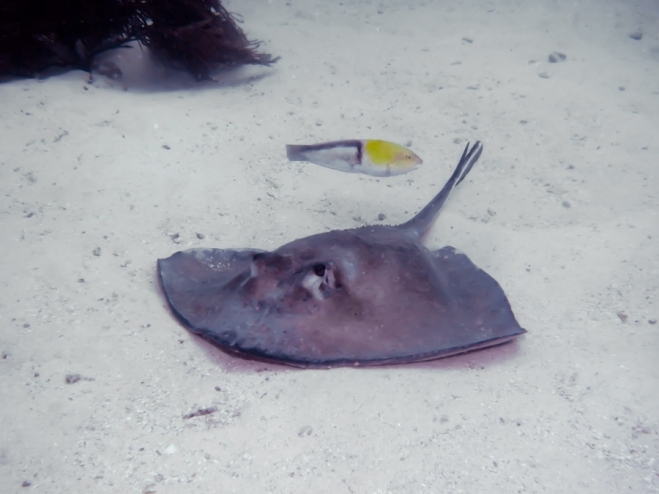 Enjoy a stingray resting with his friend on the ocean bottom.